Are today’s college families buying at the top of the price chart? The economic realignment of education will . 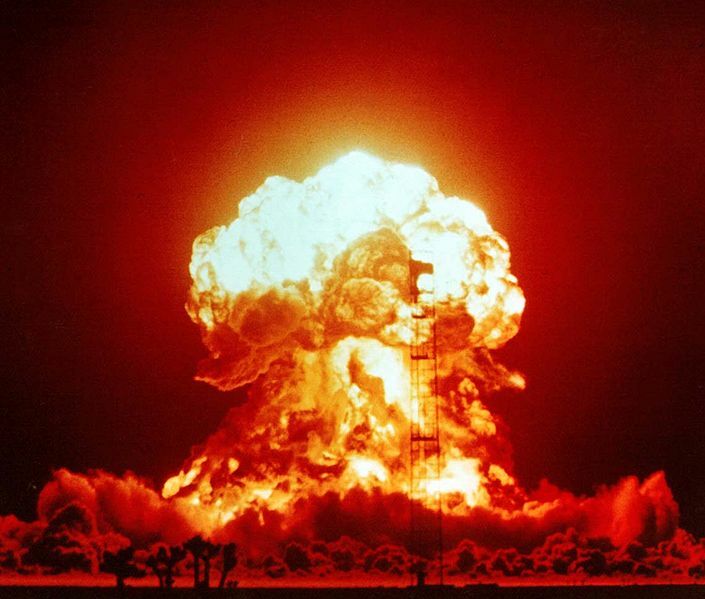 . . most likely take place in the next five to ten years. According to Frank Ryan, the higher education bubble has burst. If this is true, families with children now in college are buying at the top, just like the unlucky homeowners who bought at the peak of the last housing bubble about five years ago. Evidence for this pending “collapse of the education systems” includes soaring tuition costs, record student loan debt, escalating loan delinquency rates, declining college enrollment, and Moody’s negative financial outlook for the higher education sector. There will be winners and losers in the coming years, with “marginally profitable schools, or schools with high debt loads which depend upon taxpayer support”, finding it difficult to survive. First, to stem declining enrollment, tuition will decrease. Schools will struggle to maintain enrollment and in order to cover their fixed cost will be forced to reduce tuitions to encourage students and enrollment. Second, faculty tenure and burgeoning cost of academic instruction will come under question and will be changed. While existing tenured faculty will probably not be affected, the probability of getting tenure for other professors will be significantly more difficult, except at well-funded academic institutions. Pay will likely decline as well. Third, entire educational institutions will begin to file bankruptcy. There has already been a major bankruptcy of a university in Atlanta, Georgia. Other institutions that are not well-funded will meet the same fate. Fourth, it is very obvious that academia will be forced to justify its cost relative to the value garnered from the education. This will be one of the first times in history that the value of education relative to the cost will come under scrutiny. Will a year of college cost $100,000 in 18 years? Parents of a newborn today may need to plan for college prices that average over $100,000 a year by the time the child is ready to enroll in 18 years. The findings? In 18 years, the average sticker price for a private university could be as much as $130,428 a year (see chart below). The situation isn’t much better if you go the public route. Sending your child to a state university could set you back at least $41,228 a year. These projections are reasonable if you consider that annual increases in college costs have averaged well over 5% in the last 30 years, almost twice the general inflation rate. However, these projections are less reliable if we are experiencing a higher education bubble that will soon deflate and prevent prices from continuing to rise at historical rates. Here’s one hypothetical savings plan for a newborn’s future college expenses. It assumes a current annual cost of $40,00. How much will college cost in 18 years and what do you need to save? A 4 year degree is estimated to be priced at $414,913.19 for students enrolling in 2030 if tuition increases 5% per year. Assuming you have no current college savings, monthly deposits of $821.10 into a 529 or other college savings plan earning and after tax or tax exempt return of 7% will be necessary to achieve this balance. One father of three young children described his challenging predicament this way. The average student will apply to more than nine schools this fall, according to the National Association for College Admission Counseling. In an age where students can not only visit schools almost every day, but can also access limitless information and virtual tours from home or their cellphones, this figure seems much too high to those of us working in higher education. I was surprised to hear the number is that high. But I disagree with the writer, an admissions counselor who scolds students to be more thoughtful and scale down on the number of their college applications. She blames students for escalating this crazy “admissions game” as they casually add colleges to their lists without careful research, leading to a situation where “enrollment managers and admissions offices are struggling to forecast how to fill their classes”. Her advice? Figure out what you need and want now, and apply to five or six schools, max, which offer you most, if not all of it. Forget about trying to get as many acceptances as possible to places that don’t speak to you. Most of the commenters disagreed with the author, as did I. The number one reason for applying to so many (12) colleges in our case was financial. … for many students, the number of applications is driven by economic uncertainties, not by lack of self-knowledge…. Absolutely unpredictable which schools dished out the most merit money to which kid. Only a fool (or a 1%er) would follow Ms. Suriani’s advice. Another reason for so many applications is the secretive admissions process at many schools. Given the lack of transparency on the part of those most competitive schools, it is best to treat acceptance as independent random events, so the more you apply to the greater the chance of getting into one of them. And then there’s the illusion that most kids really know what constitutes a good “fit” for them. Sometimes it seems that colleges forget that the other half of the equation in admissions is 17 or 18 year old kids who feel (rightly or wrongly) that their futures are on the line. Kids, really, who don’t have that good an idea what “fit” is good for them. Who don’t yet know if they are a person who likes big cities or small towns, who think they “might” want to study engineering, but also really liked that creative writing class they took senior year in high school. The colleges are the grown ups in this equation. It is time for them to start acting like it. Until colleges change how the game is played, it’s likely the number of applications will continue to grow. On the other hand, if the “higher education bubble” bursts, applications to some schools may plummet. Related: Is it wrong to be your kid’s administrative assistant? Will a portfolio replace a college degree? If we are experiencing a higher education bubble, characterized by skyrocketing costs for degrees of questionable value that are increasingly only affordable by assuming growing amounts of debt, what comes after the bubble bursts? Glenn Reynolds writes about how portfolios could replace some degrees as the credential of choice for employment. Another opportunity exists in alternative methods of certifying knowledge. A college diploma serves as a basic signifier of its holder’s basic competence, but with costs running well into the six figures, it’s an awfully expensive credential. One sign of a higher education bubble is that too many unprepared high school graduates are enrolling in college. So instead of enrolling in a four-year degree program that will leave him paying back loans for twenty years or more, it might make more sense for a student to focus on the key skills needed for his career of choice. He could then create a portfolio of credentials or “badges” that demonstrates his capabilities for a job in technology, customer service, healthcare, human resources, or any number of fields. This makes more sense than the broken system we have now, where an urban studies major struggles to pay back student loans while working as an administrative assistant. It’s hard to predict exactly how such a significant evolution would take place, but it might be useful to remember the days when it was rare that want ads for administrative staff included “college degree preferred” in their requirements. That change probably happened over twenty years or more, but the move to a new credentialing system could take less time. Writing is one skill that could benefit from such a change. I can see how high school graduates could become better writers by taking a few targeted courses instead of spending most of four or five years studying partying on a typical college campus. Employers should welcome this new type of credentialing since they now have a difficult time finding qualified employees to hire among recent college graduates. ADDED: A new report by the Georgetown University Center on Education and the Workforce says that certificates are the fastest-growing postsecondary credential awarded and have demonstrated increasing clout … in the labor market. In writing about the higher education bubble, Jerry Bowyer had this observation. Furthermore, there has been a severe contraction in the quality of higher education in America. Did we really think we could open the floodgates and not affect the quality of graduates? Can you turn college into the new high school, and not get high school-like results? Grade inflation will only keep the problem concealed for so long before the general public becomes aware that outside of a few highly challenging programs and majors, the quality of American higher education is plummeting. Graduates are mastering fewer facts, can’t think critically about the facts they have mastered, and can’t express whatever ideas they have mastered in clear, cogent, grammatically correct sentences. Employers already know this. Professor Mark Perry thinks most college professors would agree with Bowyer. 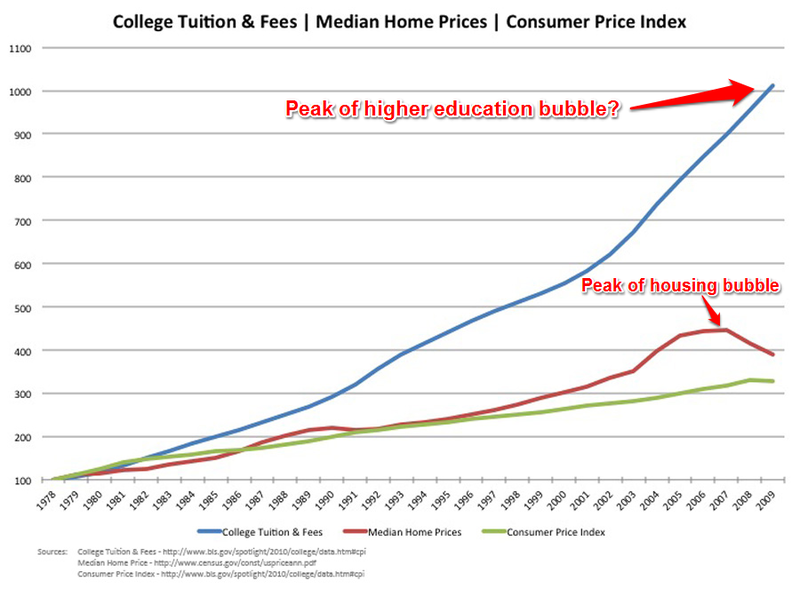 As others have, Perry compares the housing bubble to the higher education bubble. It seems clear now that because of dual political obsessions, we have “oversold” both homeownership and college education to the American people, by artificially lowering the costs through government intervention and subsidies. As economic theory tells us, if you subsidize something you get more of it, and that’s what happened with both homeownerhip and college education – but we got too much of it, and that has led to twin bubbles. Just like government policies turned “good renters into bad homeowners,” it’s now apparent that government policies have turned “good high school graduates, many of whom should have pursued tw0-year degrees or other forms of career training, into unemployable college graduates with excessive levels of student loan debt that can’t be discharged.” Perhaps economics textbooks in the future can illustrate the concept of “government failure” with these two examples of government-induced, unsustainable bubbles? Just as too many unqualified home buyers took on mortgages in the run-up to the housing bubble, maybe too many unprepared high school graduates are enrolling in college. This comparison between higher education and the newspaper business seems apt. Its far too easy to borrow money for college. Did you know that there is more outstanding debt for student loans than there is for Auto Loans or Credit Card loans ? Thats right. The 37mm holders of student loans have more debt than the 175mm or so credit card owners in this country and more than the all of the debt on cars in this country. While the average student loan debt is about 23k. The median is close to $12,500. And growing. Past 1 TRILLION DOLLARS. As far as the purpose of college, I am a huge believer that you go to college to learn how to learn. However, if that gaol is subverted because traditional universities, public and private, charge so much to make that happen, I believe that system will collapse and there will be better alternatives created. Reading this on Cuban’s blog, I was amused by his writing errors. I’m sure he writes quickly and eschews basic spell checking. Somehow, it’s entertaining to see “its” and “thats” with missing apostrophes in a billionaire business magnate’s writing. The lesson might be that perfect grammar and correct spelling are not always essential for good communication. There are probably a few other self-made billionaires who can’t be bothered to know when to use “it’s” instead of “its” *. * Actually, I think the more common mistake is to add an unnecessary apostrophe. “61 percent of folks with a student loan are not paying,” notes Andrew Gillen, Ph.D., of the Center for College Affordability and Productivity. Many of the non-payers are still in school, but many others have long since graduated, but are failing to make payments on their student loans. “To give you sense of how unhealthy this is, consider that after the worst housing price crash in our history, 28% of mortgages were underwater.” In short, it looks like there is a huge higher education bubble about to explode in taxpayers’ faces. A graphic overview of the student loan problem, including historical information showing how it was in the 1960s that the federal government stepped up its role in financing higher education.
. . . just as one couldn’t imagine house prices being as high as they now are if mortgage financing were not available, it is difficult to believe that colleges and universities could have increased their charges so rapidly over time without the ready availability of students’ ability to borrow. Arthur M. Hauptman, public policy consultant specializing in higher education finance.